Having built a few Takom kits now, I must say that I really do enjoy Takom’s approach to kit engineering. While some details are simplified, which will not be to everyone’s tastes, the lower parts count will mean that your started kit will come together quickly and get built rather than be stuck on the “shelf of doom” for the next few years or decades. 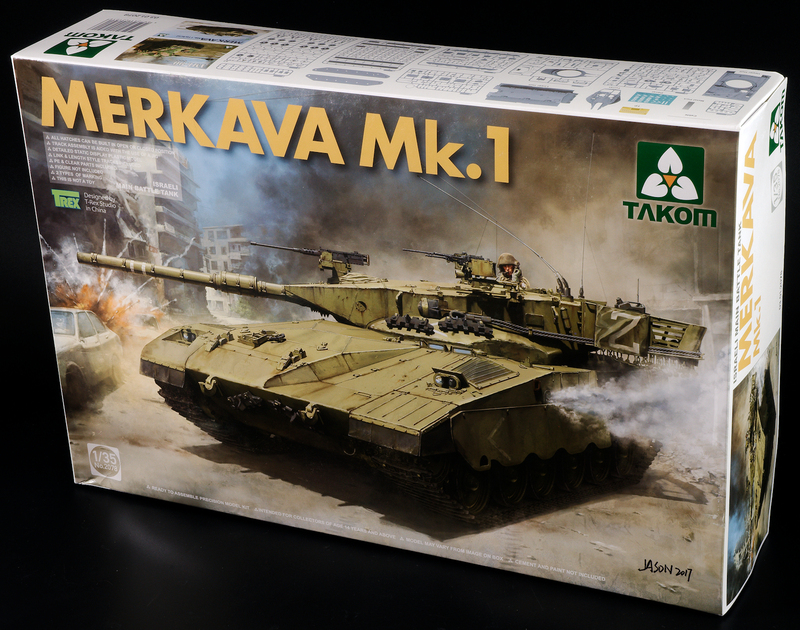 Construction of the Merkava starts with the lower hull as usual, and the first four steps involve the lower hull and running gear. The instructions have you remove some moulded on detail but they will be hard to spot once the sideskirts go on. A variety of suspension detail is added on and the instructions do not mention in any particular order, however, I did find it easier to install parts A20 and A21 with the main springs after you have installed the other details in step 1. The wheels and idlers are shown as a sub-step to step 4 but logically should be step 3 since the idler and drive wheels are needed to be placed on the jigs for the tracks. The idler wheels have lightening holes around the circumference of the wheels which need to be drilled out. Takom gives you a jig which is keyed perfectly around the wavy edges of the idler wheel to drill out the holes, but at twenty holes per wheel meaning eighty holes to be drilled altogether for the four faces of the wheels, so be prepared for some sore fingers from twisting that pin vice. The outer faces of the wheels have separate tyres and inside rim to make painting easier, but the tyre still features the outside rim of the wheel so you will still need to mask it limiting the feature of the separate tyre. Step 3 is the construction of the tracks using the two jigs provided. The instructions for the tracks are easy enough to follow but they don’t show you which way the tracks should be aligned, which should be pointed downwards like a wide “V” if looking at the tank head on. I followed the instructions and made sure not to glue on the lower run of tracks around the jig. Step 5 wraps the tracks around the wheels and the fit is almost perfect and the lower run glued on hold the ends perfectly in place around the wheels. Steps 7 to 12 deal with the upper hull and its various details but there is not a great deal to write about here with the parts fitting very well. 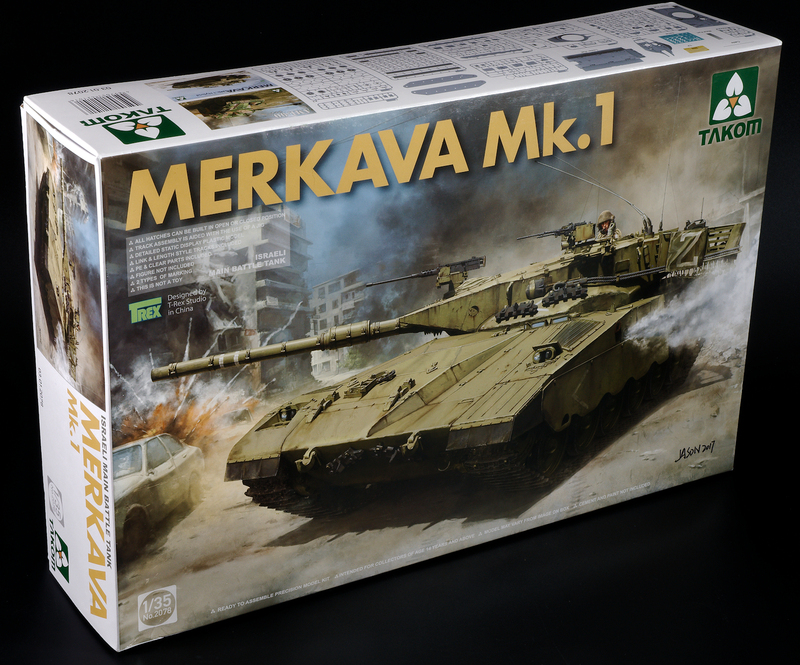 The Merkava Mk1 was originally introduced without anti-slip surfaces which were retro-fitted so I chose not to add any to the kit. Steps 8 and 9 involve the rear door and the kit gives you the option of having the door opened or closed but with no interior detail at all, you’ll find yourself looking into the void if you do choose to pose the door open. Step 12 has you put the upper hull shell onto the lower hull, but the flap on the side of the front fender means you will not be able to remove or replace the tracks once the top is glued on so I chose not to glue the upper hull until I have painted the lower hull and tracks. The sideskirts are attached in step 13 but I have glued them in place to the upper hull. Just make sure the tracks are pushed fully into their mounts and you will be able to dry fit the upper and lower halves of the hull. Steps 14 to 28 cover the construction of the turret, but the number of steps makes it look a lot more complex than it actually is. The hatches can be posed open with the commanders hatch on a swivel and the loaders hatch with hinges, but the instructions don’t mention this but without interior detail, you probably won’t want to unless you put a figure in the way. The only fit problem I did have in the entire kit was the sight in front of the commander's hatch which didn’t fit too well and the instructions are a little vague. Just like the upper hull, the upper turret does not feature anti-slip. The main armament comes in halves with a separate muzzle and is engineered very cleverly with the seams along the bracing along the sides of the barrel which makes clean-up much easier. Three machine guns are provided, a pair of GPMG’s for the commander and loader, and an M2 that sits above the main armament but most pictures I found of the Merkava Mk1 didn’t show the M2 so I chose to leave it off but won’t attach any of them until after painting. The rear turret basket uses PE for the lower section and the sides have the ball and chain armour moulded in place but it was also retro-fitted so I removed it which is a much easier task than attaching it if I chose to do so. The fit of the basket is excellent and the sides put enough pressure to keep the tabs in their appropriate slots so the basket can be held in place without glue so you can leave it off until after you’ve painted it. 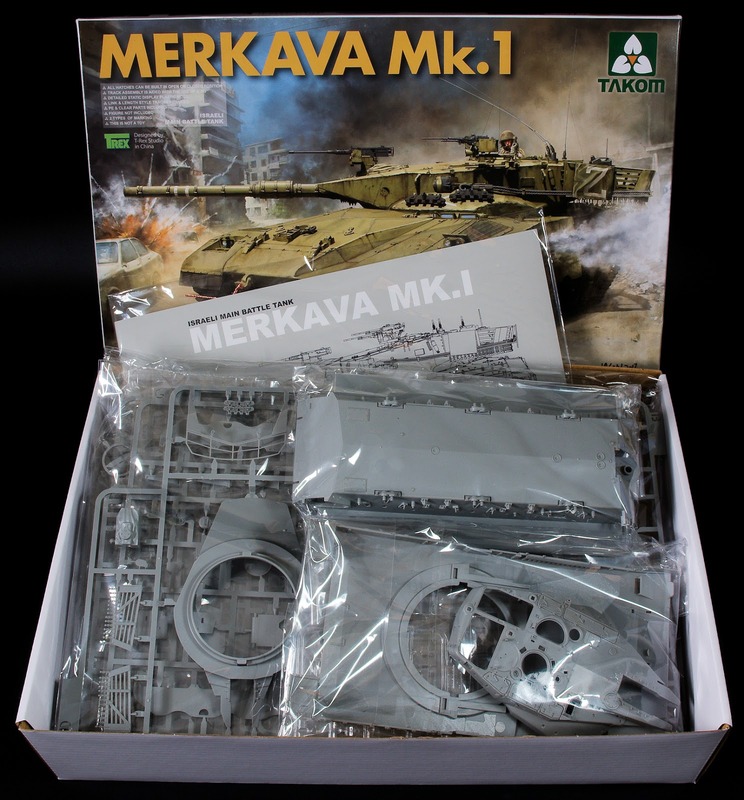 This completes the bulk of the construction of the Merkava Mk1 and as I said in the intro, I like Takom’s balance of detail and ease of construction, and this kit goes together very easily. The only aspect I don’t like is that flap on the side of the fenders which prevents the tracks from being installed after you attach the upper hull to the lower hull which means the tracks have to be in place when you attach the upper hull. However, this is also because that is how I usually like to assemble my models, and there might not necessarily be anything wrong with attaching the hull in this order but we’ll have to see how it goes as it paints up but I’m really enjoying this kit so far.